The events described in Live Big! 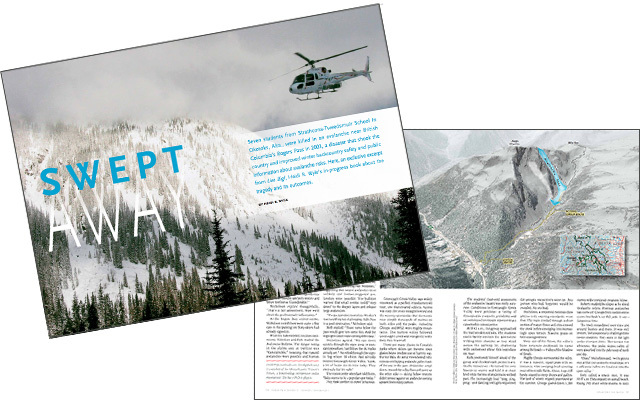 decreased avalanche deaths in Canada and saved lives. Appallingly, recently the United States suffered a similar tragedy: on January 5, 2015 Ronnie Berlack and Bryce Astle, two US Olympic Ski Team Development Team members, died in Solden, Austria while skiing with the team. They left a groomed track unaware they were entering avalanche terrain. With increasing interest in sidecountry slopes and extreme skiing and boarding, cold, white deaths of vital young people will continue. The ski and snowmobile industries should build a focused effort to decrease avalanche deaths—we can do it. Below are a small number of links for a toe in the water of this issue.